NFL players took the field for the first night of the preseason last night. A number of players took a knee or raised their fists during the national anthem, STILL protesting racial inequality. Yes, we all know the NFL doesn't want them to kneel - and especially 45 - but they did it anyway. And we're here for it. Before the game, the NFL issued a statement that said the new rules about penalizing players for protesting was on hold, however, they "expect" all of the players to stand during "The Star Spangled Banner." Well the NFL can expect whatever the hell it wants, because the players are going to do what they do. Super Bowl winning Eagles safety Malcolm Jenkins (above) held his fist high in the air before the reigning Super Bowl champs' preseason game against the Pittsburgh Steelers. His teammate/cornerback De'Vante Bausby also raised his fist. It's reported Eagles defensive end Michael Bennett walked out of the tunnel as the anthem played. Teammate Chris Long reportedly "placed his arm around Jenkins' shoulder" during the song. 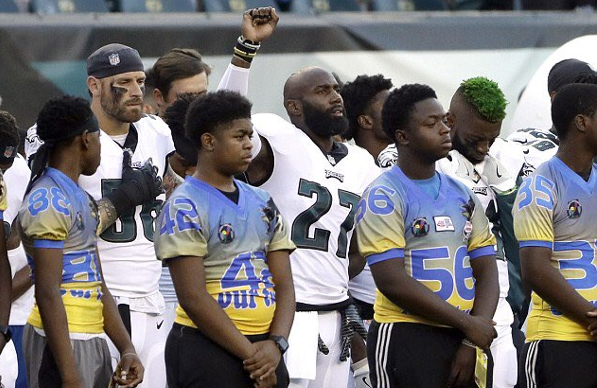 Remember when Malcolm Jenkins whipped out those cue cards with a powerful message? If not, click HERE. 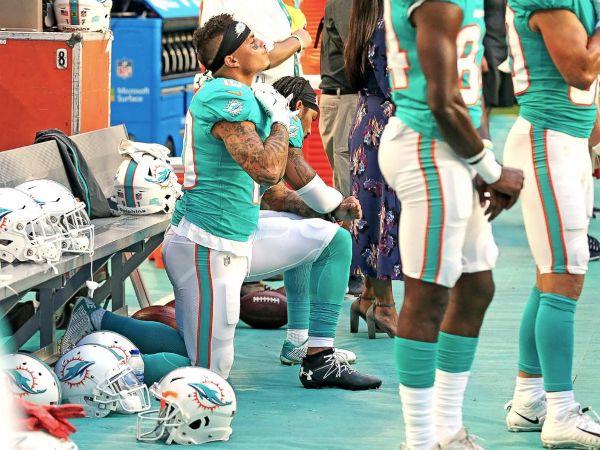 Miami Dolphins wide receivers Kenny Stills (above) and Albert Wilson took a knee during the national anthem ahead of their game against the Tampa Bay Buccaneers. 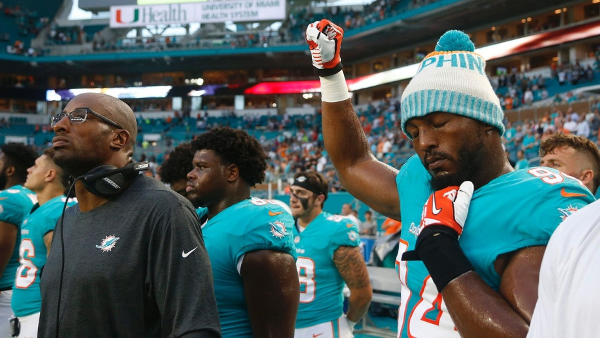 Dolphins defensive end Robert Quinn also raised his fist. As we all know, the national anthem protests started in 2016 by former San Francisco 49ers quarterback Colin Kaepernick in an effort to bring awareness to police brutality, racial and social injustices. It has never been about disrespecting anyone in the armed forces, especially since so many players have law enforcement and military members in their own families. But that's the narrative "THEY" will want you to believe. Colin has since been blackballed from the league. Of course, Trump hopped on Twitter to bash all of the players who decided to take a stand despite all of the controversy. He said everyone who protested should be "suspended without pay." "The NFL players are at it again - taking a knee when they should be standing proudly for the National Anthem," he tweeted. "Numerous players, from different teams, wanted to show their “outrage” at something that most of them are unable to define. They make a fortune doing what they love......"
In the next tweet he wrote, ".....Be happy, be cool! A football game, that fans are paying soooo much money to watch and enjoy, is no place to protest. Most of that money goes to the players anyway. Find another way to protest. Stand proudly for your National Anthem or be Suspended Without Pay! Last we checked, football players are not private citizens as it relates to government. So calling for a private citizen to suffer consequences for not pledging allegience in any way is unconstituitional, fascist and lame. We're so over this ...person. A heated exchange went down between Carolina Panthers quarterback Cam Newton and his former teammate Kelvin Benjamin (who now plays for the Buffalo Bills) before they hit the field last night. Cam pulled up on Kelvin after finding out what he said about him in a recent interview with The Athletic last week. After getting traded, Kelvin said he was happy about the trade and that Carolina was never a good fit for him in the first place. Not only that, he said being on the team with the former MVP hurt his career. Oop. "I mean, I felt like I would’ve been even more successful if … I don’t know, man … If I would’ve … Looking back on it, I should’ve just been drafted by somebody else. I should’ve never went to Carolina. Truly, I just think Carolina was bad for me. It was a bad fit from the get-go. If you would’ve put me with any other quarterback, let’s be real, you know what I’m saying? Any other accurate quarterback like Rodgers or Eli Manning or Big Ben — anybody! — quarterbacks with knowledge, that know how to place a ball and give you a better chance to catch the ball. It just felt like I wasn’t in that position." Yikes. Those were fighting words, saying he lacks knowledge and he's inaccurate. Watch Cam try to check Kelvin over the comments before their preseason game above. By the way, the Panthers beat the Bills, 28-23.